Oracle is looking to expand the market for its Sparc-based servers with a new, low-cost processor dubbed Sonoma that its engineers will discuss publically for the first time later this month. The company isn't saying yet when the chip will be available, but if it delivers as advertised it could become a new rival for Intel's Xeon chips and make Oracle's servers more competitive with those from Hewlett-Packard and IBM. Sonoma will allow Oracle to introduce Sparc-based servers at significantly lower price points than it offers today, allowing companies to use them for smaller, less critical applications, said John Fowler, head of Oracle's systems division, in an interview Wednesday. It's been a couple of years since Oracle refreshed its Sparc line-up, and Sonoma is one of a few new chips it has in the works. Oracle is expected to soon deliver an update to the Sparc T5, used in the bulk of its mid-range systems, as well as the high-end Sparc M7. Moving forward, Oracle will downplay traditional measures of chip performance like core count, cache size and clock speed, and instead emphasize the additional functionality it integrates into the silicon, Fowler said. "The last decade was about cores, clock speeds and cache sizes," he said. "What you'll see us talk about more going forward is innovations in security and efficiency. That's what we're trying to pioneer." Those functions in silicon will come first to midrange and high-end systems, but with Sonoma they'll eventually come to the low end of the market as well. For security, for instance, the Sparc M7 will have technologies for encryption acceleration and memory protection built into the chip. It will also include coprocessors to accelerate database performance. "The idea of Sonoma is to take exactly those same technologies and bring them down to very low cost points, so that people can use them in cloud computing and for smaller applications, and even for smaller companies who need a lower entry point," Fowler said. Sonoma integrates "even more functions on the chip than the M7," he said. "That's our direction." He didn't talk about prices or say how much cheaper the new Sparc systems will be, and it could potentially be years before Sonoma comes to market -- Oracle isn't yet saying. Its engineers are due to discuss Sonoma at the Hot Chips conference in Silicon Valley at the end of the month, so we might learn more then. "We didn't just create something wimpy that we'll price low," Fowler said. "It's a very powerful chip." Sonoma fits with a new strategy Chairman Larry Ellison outlined earlier this year to compete on price rather than just performance. Cisco, in particular, has been growing its server business quickly, Ellison said at the time, admitting that the entry price of Oracle's systems has been an "impediment" for some. Ellison makes a big deal about how Oracle controls all parts of its computing stack, from the processor up to the applications. That allows it to build "engineered systems" which combine compute, network and storage in systems that are pre-integrated at the factory. IBM and HP offer something similar but call them converged systems. But in fact, eight of the 10 engineered systems Oracle sells today use Intel x86 chips rather than its own Sparc processors, including the flagship Exadata Database Machine. Only the SuperCluster and Exalytics In-Memory Machine come with Sparc options. That will change with the new Sparc chips, Fowler said. Oracle will continue to offer x86 options, but the T and M-series parts will allow it to use Sparc more broadly across its engineered systems, he said. 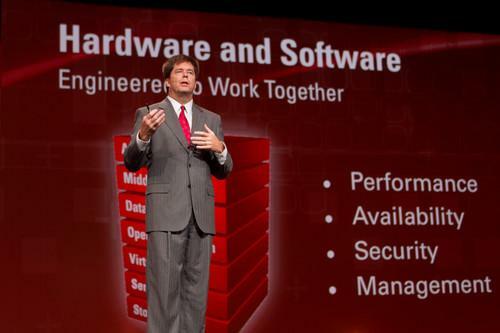 Oracle sells general purpose Sparc and x86 servers too, of course, and Sonoma will be used across both general purpose and engineered systems, Fowler said.